Often, when someone I meet for the first time learns that I am a film historian, I am asked, "So what's your favorite film?" Since I don't think it's possible to have just one favorite film — and since my favorite today is likely to be replaced by a different one tomorrow — I sometimes resort to dorky (and, yes, snide) responses that would intrigue only other film historians. "Well, 'Fred Ott's Sneeze' is an old favorite, but these days I'm really into 'Gus Visser and His Singing Duck,'" I'll say. I probably deserve a good cinematic slap in the face for such obnoxiousness, but there's a hefty dollop of truth in that response. What excites me about certain works of cinema is not just their artistic brilliance, but their historical importance. "Fred Ott's Sneeze" (also known as "Edison Kinetoscopic Record of a Sneeze") is shorter still — so short, in fact, that you can watch this historically important film in its entirety in the little box in the top right corner of its Wikipedia page. Though made in 1894 and therefore one of the earliest of all films, "Fred Ott's Sneeze" actually contains a microcosmic cause-and-effect structure: Ott sniffs snuff, which causes him, after a brief pause, to sneeze. It's a hell of a story. At only 40-odd frames long, "Fred Ott's Sneeze" may be downloaded and printed on a single sheet of paper (I used to have such a decoration on my office door), or, if you like, made into a flipbook to amuse children and house pets. My cats love it. "Fred Ott's Sneeze," ready for flipbooking. I do love me some "Fred Ott's Sneeze," but I'm here to write about "Gus Visser and His Singing Duck," which I love even more. Before you read further, I suggest that you carve out a minute and a half from your day to watch — and, more importantly, to listen to — this great little movie, which you can do freely and legally through the magic of the internets and this country's bizarre but occasionally beneficent laws concerning public domain artworks. The movie's full name, "Theodore Case Sound Test: Gus Visser and His Singing Duck," provides key information about its historical importance. Directed in 1925 by Theodore Case and Earl I. Sponable, this short was a "proof of concept" for the duo's sound-on-film process, which is usually just referred to as the "Case System." It was a sound-on-film system, that is, as opposed to sound-on-disc systems, which were also tested as producers of the audio that would accompany films' images as the industry moved slowly but inexorably toward "talkies" in the mid-to-late 1920s. The problems with sound-on-disc systems pertained primarily to issues of synchronization. As one can imagine, it was not easy to achieve perfect sync between a record (a disc) and a motion-picture projector. If the record skipped, or if the projector stuttered, sync was lost and nearly impossible to re-achieve. It was also common for a few frames of any projected film to be damaged and excised, while there was no way to reposition the needle on a spinning record to compensate for those lost frames. It was clear to most inventors, studio executives and filmmakers that sound-on-film was the only way to go. Though other inventors developed alternative sound-on-film technologies, Case's system was probably the most successful. 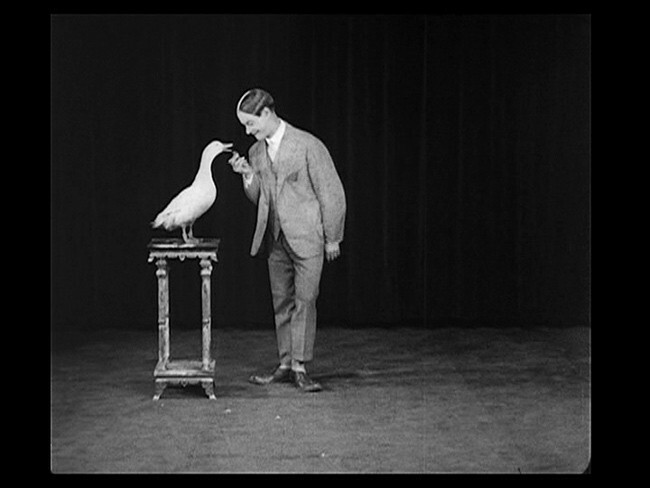 Its patent was purchased by the Fox Film Corporation (not yet 20th-Century Fox) in 1926, just a year after "Gus Visser and His Singing Duck" was made. The film, in other words, served its purpose. Case's passing grade on his sound test was achieved by his invention of an "optical track" that was printed directly onto strips of 35mm sound films. The optical track, a technology that has lasted as long as 35mm film, looks like a clear-on-black oscilloscope printout, and it runs in a thin band along one side of the celluloid strip. A specialized lamp "reads" that printed soundwave, converting it back into the audio from which it was originally made. It's one of those Ye Olden Tymes inventions that still impresses me with its cleverness of design and function. "QUACK, He's Making Eyes at Me"
The vaudeville theater was the source of many film actors and film stories. Some genres, like comedy and the musical, saw a massive influx of vaudevillians, many of whom simply "ported" their stage acts to the movie studio. Gus Visser was one such vaudevillian — though, I'm sad to say, his film career pretty much begins and ends with this here movie. Little is known about Visser, other than that he was born in the Netherlands, had one of the mightiest parts in the history of hairdressery and was one of the many vaudeville performers who made a career (at least for a time) with "trick acts." In this number, "Ma, He's Making Eyes at Me," the trick is, of course, the "singing" of the duck, which quacks every time Visser comes to the word "Ma" in his song. One marvels and, indeed, shudders to think of the rhythmic indignities to which Gus Visser subjected that poor duck. Was this the only such duck that would respond to certain physical stimuli with a blunt quack, or could Visser perform his act with any old anatine? Was the duck selected for its ability to quack on key (which it does), or did Visser adjust his voice to accommodate that of his web-footed costar? The mind boggles. Still, the film features a singing duck, for the love of Pete, and is therefore, in my book, head and shoulders above the great majority of films ever made. Attention, filmmakers: Want to impress a little-known arts writer from Vermont? Put some singing ducks in your movies. Quackest — er, quickest — way to my heart. It's hard to tell if Visser's own (presumably Dutch) accent is part of the comedy here; he could have been an "ethnic act," and therefore playing up a non-native accent for comic purposes. That accent, though, is thick enough to call attention to the Case System's successes and shortcomings. The song is, by and large, intelligible, even with Visser's accent. But the fidelity seems to have been imperfect ("lo-fi") enough to have failed to capture the full range of Visser's vocal frequencies. Still, the synchronization is perfect, and there's "room" enough on the soundtrack for the clear reproduction of both voice and music. The rationale for Fox's purchase of the Case System is plain. "Gus Visser and His Singing Duck" holds a regular spot in my rotation of Favorite Films for a number of reasons. First, it's funny as hell. It's a singing duck, people. I really can't get over this one; this film will always be funny to me. More richly, the film is a window onto two entertainment industries that fascinate me, and that were, at the time of its production, both at transitional moments. Until the more recent transition to digital technologies, the transition from silent film to sound film was the single most epochal shift ever undertaken by the cinema. Neither widescreen nor color nor even home video was nearly as transformative to the industry as was the dawn of sound. And I love to think that that massive shift was ushered in, in part, by a duck. Vaudeville, though, was going the other way. Though still fairly rich and multifarious in the mid-1920s, the art form proper was on a downward slope. Acts of Visser's ilk would not last much longer, though many still-surviving vaudevillians did get a bit of a boost in the early days of television. In truth, vaudeville has never gone away, and remains one of the most important and quintessentially American forms of entertainment. It is, in some ways, the ur-mode of American entertainment, showing up in veiled form in such forums as "American Idol," sketch comedy shows, various kids' television shows, many a modern film musical, late-night talk shows and countless other films, shows and performance events. But "pure" vaudeville, of the type represented by Gus Visser's act, is a rare bird these days. The perfecta of Historical Importance and Comic Greatness is rarer still, which is why you might consider adding "Gus Visser and His Singing Duck" to your own list of favorite films.